Natural range Western Japan including several islets. Habitat Forest, urban area, and so on with much sunshine. Range in Japan Introduced to and established on Hachijojima, Izu Islands Group. Origin Eastern and southern part of Kyushu, southwestern Japan, according to mitochondrial DNA sequences. Impact Potentially: Competition and/or hybridization with an endangered native congener P. latiscutatus. 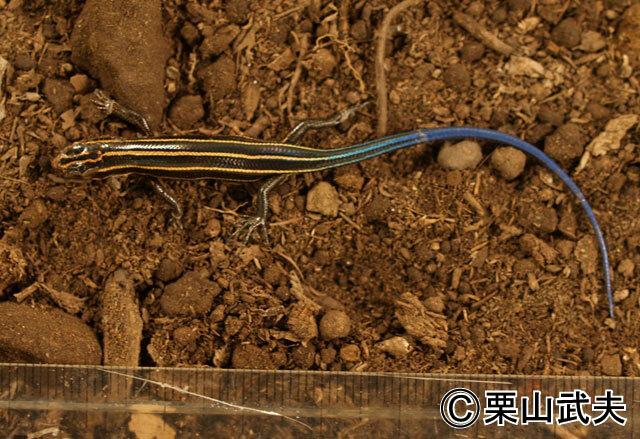 Okamoto & Hikida (2012) A new cryptic species allied to Plestiodon japonicus (Peters, 1864) (Squamata: Scincidae) from eastern Japan, and diagnoses of the new species and two parapatric congeners based on morphology and DNA barcode. Zootaxa. 3436, 1-23. According to a recent taxonomic change, eastern Japan and far eastern Russian populations should be a distinct species P. finitimus. The non-native population on Hachijojima Island belong to P. japonicus sensu stricto.